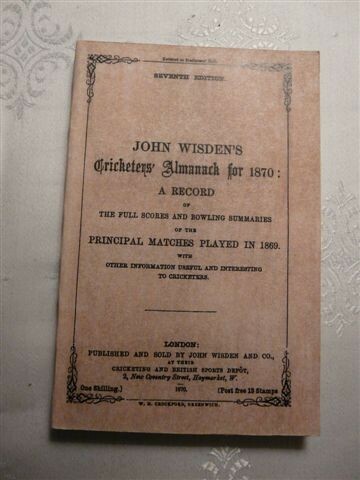 THIS 1870 WISDEN HAS FACSIMILE COVERS AND SPINE MADE BY PETER TAYLOR WHICH ARE IN AS NEW CONDITION. THE REMAINDER OF THE BOOK IS ENTIRELY ORIGINAL,COMPLETE AND IN EXCELLENT CONDITION AND ,UNUSUALLY, WITH NO FOXING.THE TITLE PAGE HAS A VERY SLIGHT AREA OF DARKENING TOWARDS THE TOP BUT OTHERWISE NO ISSUES TO REPORT. Payment Details: Cheque payable to "Bosun Books"